You've probably seen the term Park Flyers when reading about radio control flying, but what are they exactly? Well, the name really just refers to any electric rc airplane that's small enough to be flown in an area such as a public park, parking lot, school field or similar kind of space. It's important to remember, though, that when considering flying your plane in any public area you need to check whether or not flying an rc model airplane is permitted in that area. Some local authorities don't allow it, and the fact that you've just bought a new rc park flyer doesn't necessarily give you the right to fly it in a public park! Above: me getting ready for some park flying fun. But check you have permission first! But why are park flyers planes that changed the hobby? Well, perhaps that's a bold statement, but such radio control planes really have opened the hobby up to thousands of newcomers who otherwise might not have been so enthusiastic about having to join a club and fly an internal combustion (IC) powered model plane. To many, the idea of just grabbing a simpler electric plane and popping down to the local park is much more inviting. They don't need the accessories that IC ones do, and a foam rc plane is a lot easier to repair than a more complex balsa/ply one, generally speaking. Park Flyers can be purchased in RTF and ARF form or can be scratch built or built from a kit, depending on your preferences. RTF electric park flyers are by far the most convenient, and there are some excellent value deals around. Ready To Fly rc planes suitable for park flying are very widely available these days and make up a huge number of sales globally. The recent and ongoing revolution in radio control and electronic technology has resulted in a massive increase in the number of smaller size RTF electric airplanes being sold in the last few years, bringing thousands of new pilots in to the hobby of radio control flying. An RTF rc airplane is very convenient because it can be charged and flown pretty much straight from the box, although there's obviously still a learning curve there if you're starting from scratch. But the point is that a simple electric powered (EP) RTF plane gives anyone a great chance of learning to fly successfully. Size-wise, rc park flyers are typically less than 40" or so wingspan although there's no hard rule. They can cover a wide variety of plane designs; shown below are two very different examples, the simple ParkZone Slo-V, left, and the fast delta-wing Stryker. In fact, these two airplanes are at the extreme opposite ends of the Park Flying scale in terms of design, price and performance! So where can Park Flyers be flown? 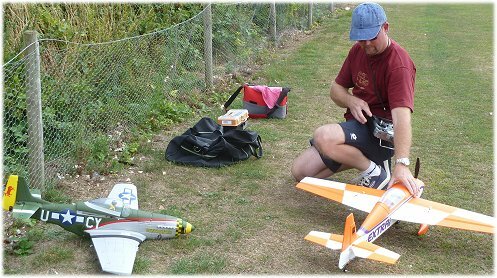 The great thing about park flyer rc planes is that they have a low 'nuisance factor', because they are fairly small and quiet. They make an excellent introduction to radio control flying, but please remember to check where you can and cannot fly in your local area. Private fields or meadows (with owner's permission, of course). When you're looking around for a suitable flying site, use Google Maps. This saves a lot of footwork, and you can check out areas very quickly. Make up a shortlist of likely places, and then go and check them out for yourself. 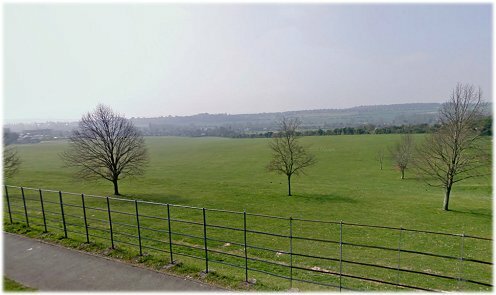 Above: this kind of public playing field is perfect for park flying. When you do fly in a public area with your park flyer, common sense must prevail. Keep well away from people, property, animals, buildings and vehicles etc., and if there are other rc pilots around go and speak with them and establish some common ground rules. The important thing is just to act and fly responsibly, but have fun - park flyers are just a great excuse to get out there and fly! Read the Flight School lesson on where to fly. The idea of getting insurance just for flying a little radio controlled plane around a park might seem a bit absurd to the newcomer, but getting some kind of public liability insurance is a very good idea. If you join a club, it's usually mandatory. Sadly accidents can and do happen, and an rc airplane can do damage to people and property. Having your back covered by some kind of insurance policy is good peace of mind and well worth the small cost. Below are links to different countries' aeromodelling governing bodies where you can find out more about insurance for model flying. International Aeromodelling Commission of the FAI (CIAM) - our sector of the World Air Sports Federation (FAI: Fédération Aéronautique Internationale). The FAI is the global governing body for all air-related sports, model and full size. Academy of Model Aeronautics (AMA) - the official national body for rc aircraft within the USA. Model Aeronautics Association of Canada (MAAC) - the official national body for rc aircraft within Canada. British Model Flying Association (BMFA) - the legal body within the UK. Model Aeronautical Association of Australia (MAAA) - the official body for model flying in Australia. Model Flying New Zealand (MFNZ) - the official body for model flying in New Zealand. RC flying do's and dont's.